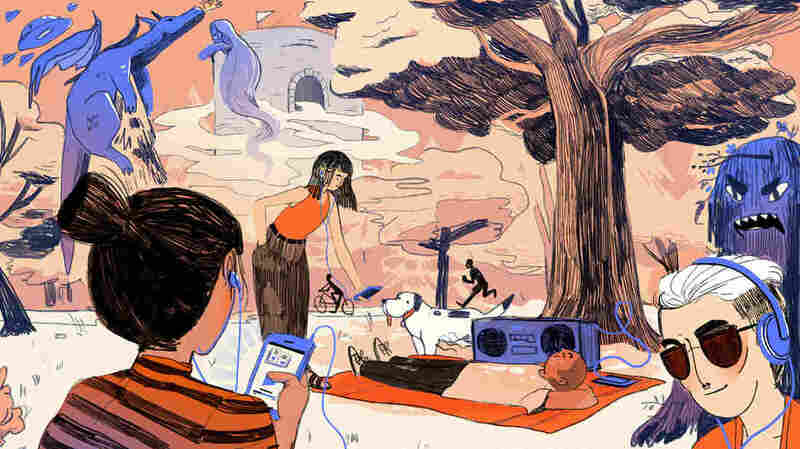 A Publisher Tries Podcasts As A Gateway To Audiobooks Audiobooks are the fastest growing segment of the publishing industry, while podcasts are also finding new audiences. One science fiction publisher is experimenting with a new path to the market. Audiobooks are the fastest growing segment of the publishing industry, while podcasts are also finding new audiences. One science fiction publisher is experimenting with a new path to the market. Podcasts — everyone seems to have one. And more and more people are listening to them. At the same time, sales for audiobooks are growing faster than any other segment of the publishing industry.That got me wondering: Are podcasts helping to drive listeners to audiobooks? The answer, as it turns out, is more circular than that. Macmillan Audio, a division of one of the big five New York-based publishing houses, got into podcasting a decade ago, says president and publisher Mary Beth Roche. "It looked like an interesting new way of reaching consumers, at a time when we were experimenting with a lot of different digital ideas." Macmillan teamed up with Mignon Fogarty, who'd created her own Grammar Girl podcast and then started a network around it. Together, they built the Quick and Dirty Tips network, or QDT for short, featuring experts on everything from grammar to personal finance. Roche says the QDT podcasts "were all a very particular type — short format, tip oriented, actionable, helpful advice on a variety of subjects." Now, Macmillan Audio wants to expand into a different format, the long-form narrative. And to do that, it's tapped subsidiary Tor Books, which specializes in fantasy, horror and science fiction, genres Jen Gunnels describes as "good, gooey, wonderful, fannish, delightful, geeky wondrousness." Gunnels, an editor at Tor, says genre fans are not only avid readers, but also early adapters, willing and open to experiments with new technology — the perfect audience for Tor's new podcasting project, which reverses the traditional route for publishing a book. Gunnels says print is usually the primary format in publishing, "and we thought well, what's to say we couldn't make audio the primary format? And we kind of went from there, building it from the ground up." Starting in August, Tor will release a 14-part podcast of an original audio drama called Steal the Stars, by Mac Rogers. It's a love story set at a secret military base where an alien and its spacecraft are under guard. Once all 14 episodes of the podcast have aired, Macmillan will release it as an audiobook. It has also commissioned a novelization of the play,which will be released as a paperback and an e-book. Mary Beth Roche says it's an interesting experiment, because podcasts can be a gateway to audiobooks. "For people who are just getting used to spoken word entertainment, it's an interesting entry point," she says. "It's not too much of a commitment. It's not as scary as, say, oh I'm going to download this 30-hour audiobook." She adds that the popular podcast Serial is a good example of how this works. "A lot people came to that, they heard about it, they were enjoying it, and thought what else can I listen to? " But there's another way that Serial and other popular podcasts drive listeners to audiobooks: Advertising. Audible, the Amazon-owned behemoth of the audiobook world, frequently advertises on some of the best known podcasts. And Audible isn't only the largest retailer of audiobooks — it also produces original audio content. The company believes it has made long form listening a habit for millions of people and that, in turn, has helped the podcast boom. Andy Gaies, Audible's chief content officer, says there is a synergy between podcasts and audiobooks that benefits both. "I love the fact that more people are listening," Gaies says, "And whatever path people take to experience spoken word content for the first time is fantastic." And there may be one overriding reason why both podcasts and audiobooks are doing so well — people just like listening to stories. Editor Rose Friedman and web producer Petra Mayer contributed to this story.